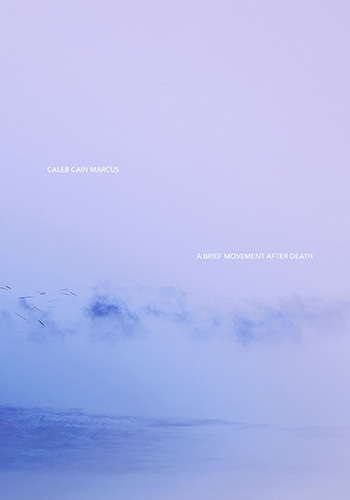 In his introduction to A brief movement after death, Caleb Cain Marcus explains the motivation for the series: “A brief movement after death explores the release of energy from the body into the universe when we die…. As I watched my daughter interact with the world, I saw how many experiences were ahead of her that I’d already lived. She was moving toward life in all its brilliance and I toward death. My questions about what happens when we die resurfaced and I began to explore how to visually represent what occurs after death.” Cain Marcus goes on to explain that “[with] the motion of a pendulum, the grease pencil is swung by a string to make tightly grouped marks that reference the finite quantity of time in a life span and that moves across the paper as if in a formation of light leaving the earth”. The twenty images in Cain Marcus’s book play on very basic visual pleasures: the contrasts of figure and ground, of color and absolute black, of saturated color and also pale gradations; multiplicities that seem to act as one, and the tension between weight and weightlessness. The skies’ subtle palettes ease between warm blushes and cool ambience and between pastels and bold orange. Small dark blue clouds appear to gather mass as they approach black. A thin band of continuous tone runs across the bottom of each image- in some cases this might be the average of the tones in the image - providing an additional contrast between articulated forms and uniform color. Cutting across the expanses of skies are what appear to be tiny fleeting figures: they could be schools of fish, their silver inverted into black, or more properly they might be assumed to be birds, though clearly they are not. Having no bodies, they resolve as indices of direction and movement, so black that they might be the negative trace of shooting stars. These are the marks of Cain Marcus’s suspended grease pencils, not part of the photograph, but matter that adheres to it. The physical markings on photographs’ surfaces comment on the photographs’ durational aspect, as the marks are made in the “living time” of the world in which the print exists, not in the captured time of the photographic part of the image. At the same time, there is a textural aspect to these images, of grease pencil skimming across the surface of the prints, that is significant, but that the book’s reader cannot experience. (With this knowledge, my reading of the book shifted to be more as a catalog than as an art book - I hold it knowing that I’m not able to access all that these pieces might offer in person). These scenes seem to speak directly to form, movement, light and color that we might observe in nature, even as there is little that corresponds to what we might find in a natural environmental. The images resonate with visual ideals, the apparently impossible made visible. If these pictures were music they would be perfect fifths played on perfect instruments, celestial harmonics with no dissonance. Alfred Stieglitz comes to mind, when describing his “Equivalents” in 1923, photographs “of” clouds that were intended to demonstrate that photography’s formal possibilities as art should not be obligated to pictorial genre or the perceived strength of subject matter. “I knew exactly what I was after,” wrote Stieglitz. “I had told Miss O’Keeffe I wanted a series of photographs which when seen by Ernest Bloch (the great composer) he would exclaim: Music! Music! Man, why that is music! How did you ever do that? And he would point to violins, and flutes, and oboes, and brass, full of enthusiasm, and would say he’d have to write a symphony called ‘Clouds’.” Cain Marcus operates in a similar mode- these images are not photographs of clouds, nor are they, for any similarities between images, a typology. As a group, the sequence of images describes an arc through ethereal paleness to saturated surety, the traces present throughout, a series of statements that begin as photographs even as they seek to visualize something that cannot be photographed. The larger question raised by this work is how Cain Marcus’s work connects concepts of mortality, spirit and soul with aesthetic experience and aesthetic pleasure. Historically our ways of visualizing such concepts have often relied on symbolic language. Cain Marcus does as well - clouds, flight, and the color of the sky are familiar means of framing the afterlife. Cain Marcus also puts style in the service of symbolism, evoking the pleasures of lightness and spareness. He deploys the images’ photographic aspect as a symbolic element and then disrupts it with his surface markings to both call on a sense of photographic fidelity to the seen world and to describe something that no one has seen, at least not in this way. Cain Marcus’s visualization of spirits leaving the earth are romantic and soothing. They describe the leaving behind of worldly concern, the sense that spirits go upwards and into the light. Are these images in A brief movement after death beautiful because they are comforting? Or are they comforting because they are beautiful? The visual terms are his own; he is answering his own questions about mortality, and not anyone else’s. But his intention is so much in the foreground that it cannot but color my readings of the images. There is something so physical about his visualization, it is so specific, in both its symbols and its photographic-ness and it is something that I can read but with which I cannot identify. It gives me pause; these pictures cannot be part of my experience, they speak to me in language but they are not something that I see and know, and in this they are, if it matters, unphotographic. Photography’s history is full of efforts to visualize the unseen, from Eadweard Muybridge’s and Etienne-Jules Marey’s motion experiments to Trevor Paglen’s studies of secrecy. Cain Marcus’s photographs are a projection, an act of imagination, walking a line as all photography does between reference and description. While I can read the image, I have not had the experience to validate the description, and so I read his work as a proposition, maybe a wish, rather than as a revelation. All images © Caleb Cain Marcus from the book A brief movement after death published by Damiani.